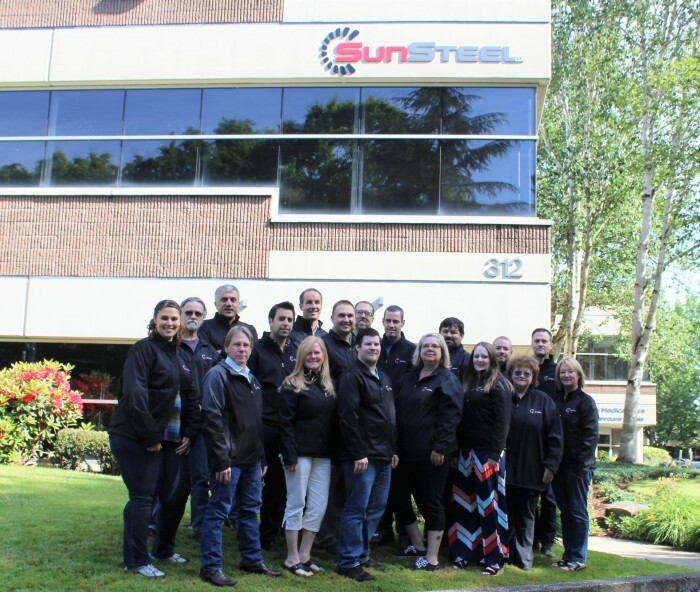 SunSteel LLC., operates one of the largest, most modern and highest capacity AISC certified shops on the West Coast, totaling 250,000 square feet in Sunnyside, Washington. In 2015 the Corporate Headquarters moved to Vancouver, Washington (see photo). We service commercial and industrial projects throughout Western Canada, the Pacific Northwest, California and the Intermountain Region. With a very strong dependable work force we have the capacity and capabilities to meet your project needs. SunSteel LLC can offer turnkey solutions to include joist/deck supply, miscellaneous metals, and installation. SunSteel, LLC produces fabricated steel to frame all types of conventional and complex steel building structures. This includes, but is not limited to, columns, beams, trusses, and plate girders. Miscellaneous stairs and rails, steel joist, steel decking, ornamental metals, and in-place erection are also services generally included in SunSteel, LLC’s scope of work. These services are performed by SunSteel, LLC or supplied through a network of experienced and reliable sub-contractors and suppliers. The company delivers its services through the bid market as well as then negotiated market. The company has experience in a wide range of projects, such as commercial and industrial office buildings, retail stores, distribution centers, health care facilities, sports arenas, parking decks, convention centers, aviation structures and more! There are many customers throughout the United States that we have strong relationships that help us win jobs. We devote countless hours to understanding each project and the challenges you face in getting it off the ground. We pay special attention to ensure we have the appropriate resources and work closely with all team members to facilitate communication amongst the contractors and management teams. The company has experience in a wide range of construction projects such as commercial, industrial, office buildings, regional shopping malls, power plants, distribution centers, pedestrian bridges, office and corporate buildings, public schools, healthcare facilities, sports arenas, convention centers, aviation structures, and more! With our combined operating strength of four companies, which is operated by FabSouth, SunSteel is extremely well positioned to serve any fabrication and erection need. We devote countless hours to understanding each project and the challenges you face in getting it off the ground. We pay special attention to ensure we have the appropriate resources and work closely with all team members to facilitate communication amongst the contractors and management teams.